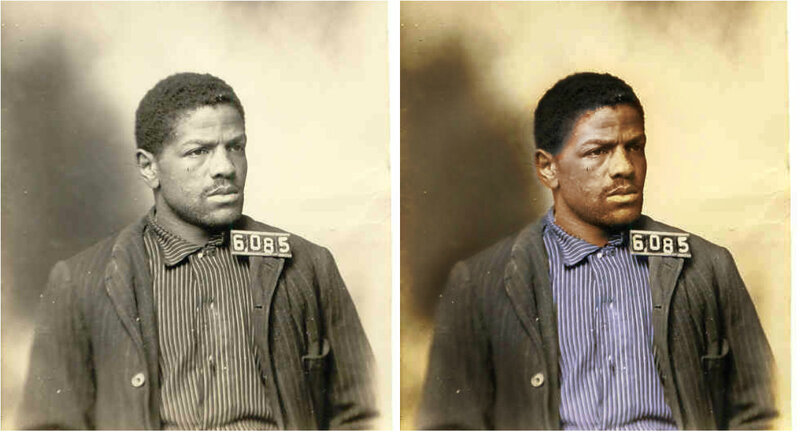 I wanted to share this colorized picture of William M. Gray, Folsom’s 22nd execution. My son has been playing around with Photoshop, and this one particular shot has always stood out to him, so he wanted to see what he could do with it. Given the information surrounding Gray’s case, I’m not entirely convinced he committed the crime for which he hanged. I’ll leave you with his last words. Categories: Folsom History | Tags: execution, Folsom Prison, Folsom's 93, hanging, mug shots, William M. Gray | Permalink. That’s a nice Photoshop job! Isn’t it interesting how much less sinister William Gray looks in the colorized version? I agree, Pat. It’s funny how color puts things in a different perspective, even though it’s the same photograph.